Deliciously fresh in flavour, creamy under the rind and crumbly at the core, this Cornish cheese is wrapped in nettles. Cornish Yarg cheese was first made by Alan and Jenny Gray in Withiel, near Liskeard, on the edge of Bodmin Moor in the 1980’s. The word Yarg is simply their surname 'Gray' spelt backwards! The inspiration for this unique cheese came from a 17th century recipe for nettle wrapped cheese found in their attic. In 1984 they sold the recipe to Michael and Margaret Horrell who farmed near Bodmin. The business steadily grew and in 1995 the Horrell family met with the Mead family who were farming in West Cornwall and interested in farm diversification. Catherine Mead worked alongside them to develop the business and in 2006 all production moved entirely to the Mead family farm. Owned by Catherine Mead, Lynher Dairies is now processing 2,000,000 litres of milk a year and making just over 220 tonnes of cheese. 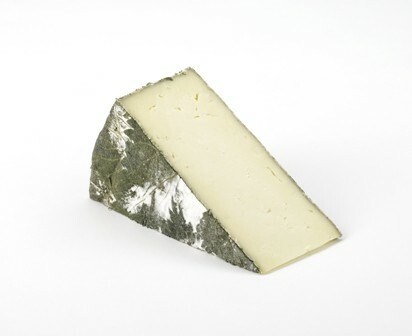 Cornish Yarg is very unique due to the handpicked nettle leaves which coat the rind. Three tonnes of nettle leaves are picked during May and June by a team of 50 hand pickers. Cheeses which are made at the time of picking are then wrapped with fresh leaves and the rest of the leaves are then frozen in bundles until they are ready to be used. The cheese making process is done by hand using the farm's milk and grass rich milk from carefully selected local Cornish farms. After the milk is pasteurised, a culture is added for ripening and rennet to help the curd set. Once set it is cut and stirred to separate the curd from the whey until each curd piece is as small as a grain of rice, this increases acidity and fermentation. The curd is then milled, blocked and hand packed into moulds, after which the cheese is pressed and immersed in brine overnight. After drying, the nettle leaves are painted on by hand in a concentric circle pattern. Yarg takes about 4-5 weeks to mature, by which time a beautiful white bloom decorates the nettles from naturally occurring moulds attracted to the leaves. As the cheese matures, it develops a delicate, mushroomy taste and a bloomy white appearance. Six weeks from field to finish, Yarg is fresh and creamy with an irresistible crumble in the core. The semi-hard rind is completely edible and adds an earthy, mushroomy flavour to the cheese. A consistent medal winning cheese for many years, most recently awarded two gold medals at the British Cheese Awards 2018. A pure fruit preserve hand made to a traditional recipe using damson plums. It is the perfect accompaniment to any cheeseboard. A selection of cheeses from one of the lushest areas in England. This collection fits perfectly in one of our stylish small gift boxes, why not add one to your order for a complete gift experience?